When I told D that we needed to use the tempeh soon before it went bad, he got this far-off, dreamy expression on his face. I thought for a minute he was having some type of male menopausal seizure, but no, he was just thinking about tempeh bacon. The first place D ever had tempeh bacon was with me in the little vegetarian restaurant we went to on our first date. It became a tradition for us to go there every Sunday for brunch, and their plate of tempeh bacon, grits, and biscuits was D’s favorite. After E came along, those Sunday morning outings became less convenient, though I still remember her sitting in a high chair, raining down biscuit crumbs and grits on everyone nearby. We were sad to hear that the restaurant closed after we moved away, but thinking of it brings back happy memories. So my apologies to D for my uncharitable thoughts of male menopause. Memories of tempeh bacon have been known to inspire rapturous looks on my face, too. When I have lots of time, I like to steam or simmer tempeh before marinating it to improve its flavor, but in this recipe, I’ve shortened the prep time by combining the simmering and marinating. The result is an all-purpose tempeh that’s less bacony than my usual recipe but can be used in many types of sandwiches. In addition to making TLT’s, you can use it in Ruben sandwiches or put it on a bun and treat it like a burger. But watch out–you may find yourself getting dreamy-eyed over tempeh, too! See the Notes for air fryer instructions. Slice the tempeh about 1/4-inch thick. In a flat, microwavable baking dish (or a large skillet) arrange the tempeh slices in a single layer. Mix the remaining ingredients and pour over the tempeh. Pre-cook either in the microwave or on stovetop. For microwave cooking, cook on high power for 3 minutes. Turn or rearrange any pieces that were not covered by broth and microwave on high for 2 minutes. Then cook at 50% power for 3 more minutes. Allow the tempeh to stay in the broth until you’re ready to pan fry. For stovetop cooking, bring the broth to a boil and reduce heat to a simmer. Simmer for 10 minutes, turning the tempeh halfway through to make sure each piece gets equal time in the broth. Remove from the heat and allow it to sit in the broth until you’re ready to pan fry it. Heat a large non-stick skillet. (If it isn’t very nonstick, you may have to wipe it with a few drops canola oil or use cooking spray.) Put it on medium-high heat until hot, and then remove the tempeh slices from the broth and put them in the pan in a single layer. (I did this in two batches.) Cook until brown, and then turn. When they are almost brown on the second side, add a few tablespoons of the simmering broth to the skillet and allow it to evaporate. (This adds more flavor.) Remove from skillet and serve immediately. Cajun Tempeh option: Sprinkle the tempeh with Creole seasoning just before you turn it for a spicy treat. For sandwiches, spread bread with your choice of condiments (I use vegan mayo and spicy mustard). 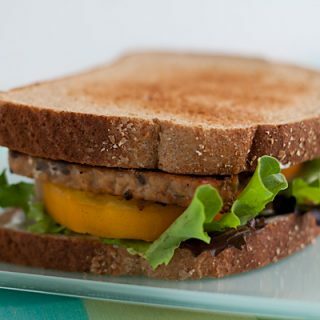 Arrange lettuce and tomato (I used yellow ones) on bread and top with strips of tempeh. 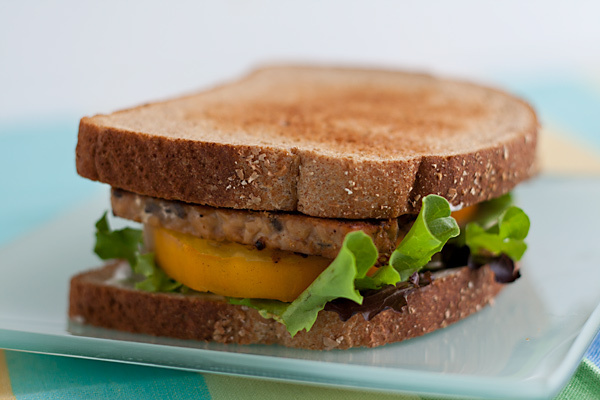 One package of tempeh will make about 4 sandwiches. To cook in the air fryer, after precooking, preheat the air fryer to 350-360F. Place the tempeh in the basket. Cook for 3 minutes. Rearrange tempeh and cook until crispy, checking every minute or two. Careful: Tempeh can overcook quickly. Susan, this looks great! But do you think I could do it with tofu? I can’t seem to find tempeh around here! I think you could, but watch it closely to make sure it doesn’t stick. You also could try marinating it for a while, removing it from the marinade, and then baking it on a silicone mat at 375 for about a half hour, turning it once halfway through. You can skip the cooking spray if you have a very good non-stick skillet. Otherwise, you will have a stuck-on mess that you can scrape off and sprinkle onto your sandwich. I made this for dinner tonight, and my tempeh hating hubby loved it! Susan…you are definitely my hero!!! This is the BOMB!!! (That is what the kids around here say when something is really, really yummy!) The addition of the chipotle is brillant!!! Just curious–is this your ‘standard’ tempeh bacon recipe? This looks so easy and has ingredients which I always have on hand (unlike some other recipes I’ve seen). This looks easy and yummy. Just curious if half of the recipe could be saved and reheated (e.g. Half for breakfast, half for lunch the next day). If so, how would you do it? Sure. I would go ahead and cook the entire recipe, and the next day I’d warm the leftovers in a microwave or warm skillet.